The genus name derives from the Greek word for rainbow; and the species name comes from the Latin “rete”, meaning net and referring to the netted or reticulated pattern on the dry bulbs of the dwarf iris. In Greek mythology Iris, the messenger of the gods, is represented by the rainbow, which forms a bridge between the heavens and earth. 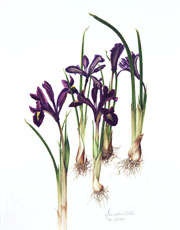 The American Iris Society dates from January 29th, 1920 whose members are dedicated plant scientists, hybridizers, enthusiastic growers and gardeners from all across the world.